Leela calls Reena and comes to know that Reena’s husband became fine after she chants Mrityunjay chants. Kunj and Twinkle come and Leela ends call. 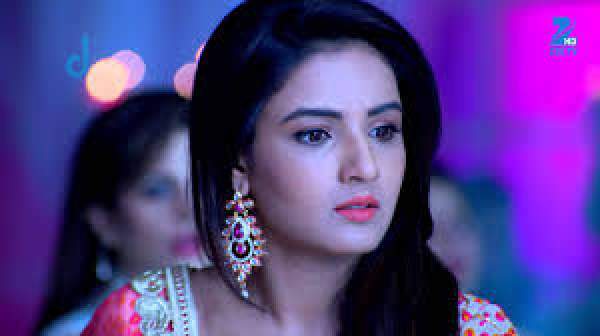 Leela asks Kunj how is he? Kunj asks her not to get emotional like her daughter and says no illness can hurt him till Twinkle is with him. Kunj says he will tell Babee and Usha once he finds the donor. Leela tells Twinkle about chants and Twinkle says she will fast for Kunj and Kunj is surprised. Yuvi in hospital and nurse feeds him. Yuvi says he doesn;t like the food and nurse says till you stay here, this will be your food and leaves. Yuvi thinks of his mom and says this is similar to jail except the handcuffs. Anita comes and gives him food and he thanks her. Anita asks him to continue his acting or else he will be back to jail. Kunj goes to Twinkle and asks her not to do Fast. Twinkle asks him to think she is dieting and he says he likes her fat. They fall on bed and Twinkle hugs him. Manohar listens to that and says someone life is in danger and Babbe says may the lord protect the one. Manohar and Babbe look for Pundit and they don’t find him. Twinkle goes to get wood for havan and finds a paper in her feet. Kunj’s name is on it she doesn’t see it. She gives it to Pundit and gets the wood. Babbe comes home and says to Leela that it was a great fay and Pundit prepres the havan. Leela thinks what to say to them when they asks her about Twinkle and Kunj. Babbe asks about Twinkle and Leela says she is nearby. Kunj says she went to donate some food to the poor and Babbe, Manohar feel proud of her. Babbe says she will meet Twinkle and Kunj says she is in temple. They go there and help Twinkle. Kunj asks is she happy now and asks will she eat now? She nods. Pundit says you did great and wishes her wishes come true. All come back home and Babbe says everything went well and tries climbing stairs. She looses balance and Kunj holds her. Kunj then slips and gets hurt by a glass. Twinkle rushes to him and takes him to the city hospital. Babbe says this all happened because of her and feels sorry. Twinkle calls Dr. Baseena nd tells the situation. Dr. Baseem says the donor is in room no 201 and asks her to take Kunj to that room. Everyone wait in the waiting room and Twinkle takes Kunj to room 209 and Yuvi is listening to music in that room. It’s awesome serial ……..I like u twinj?? ?